After using other types of Oak and testing how stable they are, we have found the most suitable is air dried European Oak for our wooden garage doors and gates . 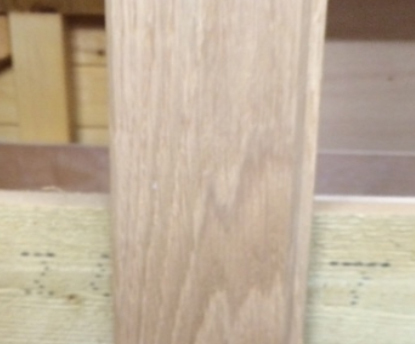 Oak is the most unstable hardwood timber we use and we do not give any guarantee to it, in any shape or form. It is light tan to biscuit in colour and the grain can vary from straight to quite figured which makes it difficult if you are trying to match with another hardwood. It is a durable timber although acidic in nature so will effect metals in direct contact and cause corrosion, therefore stainless fixing are recommended. Other factor using Oak which is generally seen in fresh saw Oak, although can occur in dry Oak, is tanning leaching out of the timber leaving black marks on the timber and other materials which is in close proximity. I have attached a link below showing tanning and how to reduce this. Click on link below to view an example of a gate produced in Prime grade European air dried Oak. Please note the photo above is only a representation on Prime grade European Oak, as it is a natural product the colour may vary.